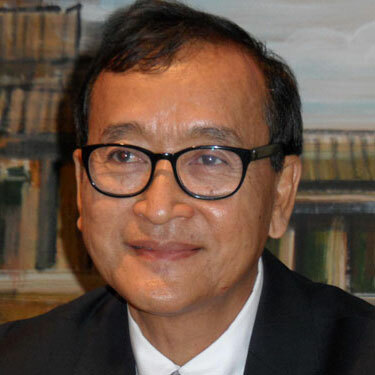 The Diplomat’s Stephen Finch spoke with Cambodian opposition leader Sam Rainsy about Thailand’s recent decision to deny him entry and his calls for more democracy ahead of Cambodia’s July 28 election. On Tuesday, Thai immigration prevented you from entering the country in Bangkok, where you were scheduled to speak to reporters at the Foreign Correspondents Club of Thailand. What happened exactly? It was apparently a very high-ranking officer and he told me that Thailand would not let me in, on instruction from the Ministry of Foreign Affairs. He said I would be welcome back after the end of July, these were his words. I understood very well: After the end of July means after Cambodia’s election on July 28. So I didn’t need further explanation. They were very polite, they took me to the first-class lounge of Thai Airways, they accompanied me and helped carry my luggage. So I have nothing to complain about with the personal treatment. But I was a little bit surprised about my being deported. Observers note that Thailand’s exiled former Prime Minister Thaksin Shinawatra – whose sister Yingluck is the current premier – has been very close to Cambodian Prime Minister Hun Sen for a long time. Indeed, Thaksin was previously an economic advisor to Hun Sen. Does this explain why you were not permitted into Thailand? What I can say, at least, is that there is a double standard because on the one hand, Thaksin Shinawatra came to Cambodia as an official and personal guest of Prime Minister Hun Sen and he has visited many times, including during a period around the election in Thailand. But on the other hand, I am the leader of the opposition now – a united, democratic opposition – and I’m not allowed to set foot in Thailand. So this is really a double standard. Last year, your Sam Rainsy Party merged with the Human Rights Party. Is this the most united Cambodia’s opposition has ever been going into an election? Yes, definitely. This is the first time ever that Cambodia has had a united, democratic opposition and this has changed dramatically not only the country’s political landscape but also the balance of power. The ruling party is now very afraid and they are doing whatever they can to stop this growing support for the united opposition because after 30 years of the same prime minister, everybody can understand the need for change. Remember that the ruling party has been in power for 34 years and Hun Sen is the longest-serving political leader in Asia. Disagreements between yourself and Kem Sokha, the head of the other main opposition party formerly known as the Human Rights Party, have been widely reported. What have been your key differences and to what extent have these been resolved now that you are both operating under the same political banner – the Cambodia National Rescue Party? Have you ever seen political leaders with exactly the same views all the time? There are always divergences. But what is important is the fact that we have succeeded in overcoming some divergences that appear minor – very, very small – compared with what is at stake: the very survival of the nation. This is why our party is called the Cambodia National Rescue Party. Whatever divergences we might have had in the past are nothing. We are determined to rescue our country. You have said many times that you believe Cambodia is in grave danger under the current government. What do you plan to do to take on Hun Sen’s administration and do you and Kem Sokha agree in terms of strategy? We are pushing for free and fair elections, as enshrined in the 1991 Paris Peace Agreements on Cambodia. They call for a free society, and a democratic government chosen by the people through free and fair elections and following a democratization process. It is not only a right, but also an obligation for all signatories to ensure that Cambodia moves along a democratic path. But the democratization process has been derailed and what we are asking for is the intervention of the international community under the Paris Peace Agreements to put this democratization process back on track. We want democratic change through free and fair elections: It’s peaceful; it’s legal; it’s in line with an international treaty. This is the path we have chosen to follow. You’ve criticized the forthcoming election on numerous counts. What exactly is wrong with it? I think the relevant points have been raised by the United Nations. The position of the UN special envoy to Cambodia, Professor Surya Subedi, is also in line with the Paris Peace Agreements. His latest report on the human rights situation in Cambodia drew attention to the fact that the election system in Cambodia is not credible and it cannot lead to a free and fair election. He made 18 recommendations but I will just point to the two most important. The first is reform of the electoral commission, which is now controlled by the ruling party, and has no credibility whatsoever. The second is the UN call for my return to Cambodia as leader of the opposition. Since we follow the Westminster system, any election in Cambodia is meaningless without the presence of the leader of the opposition and I am the only serious challenger to Prime Minister Hun Sen. So what we ask for is just respect for the UN recommendations. Given the problems you describe, what can we expect from next month’s election? I think again, the will of the people will be distorted and denied, and I urge the international community to warn Hun Sen that the way the election is organized now cannot be viewed as legitimate. Any government arising from the election must therefore be considered illegitimate. The UN has consistently called for deep reforms but since those reforms have not been addressed any subsequent elections are a farce. I ask the international community to be consistent in ceasing to recognize the Hun Sen government and to start to isolate this illegitimate government to help the Cambodian people to express their will in a different way. The acting head of your party in your absence, Kem Sokha, has recently faced a backlash in Cambodia after he reportedly said that the Khmer Rouge’s main torture and extermination facility, Tuol Sleng, was “staged” by the invading Vietnamese for propaganda purposes. What do you make of these comments? I am with Kem Sokha right now in Singapore. We have been meeting over the past 24 hours. Basically, his words have been distorted – he was quoted out of context – and I share his opinion. Like everybody, we acknowledge that Tuol Sleng was a torture and execution center for the Khmer Rouge, who committed crimes against humanity. So there is no discussion whatsoever on that point. But what we agree is that following the Vietnamese invasion (in January 1979) the Vietnamese arranged Tuol Sleng for propaganda purposes and they filled the place with skulls. That is not Cambodian at all; it is very un-Cambodian. It was arranged by the Stasi, by the Eastern bloc. King Sihanouk recommended that the bones, the skeletons, the remains of the people dead there should be incinerated according to Buddhist rites and a ceremony. The Hun Sen government didn’t want to follow King Sihanouk’s recommendation because they wanted to use it for propaganda. They wanted to use the remains of the dead and arrange them for political purposes. So this we condemn and also we condemn the fact that the Hun Sen government, out of fear of the judicial process, has blocked the Khmer Rouge Tribunal and has prevented the due prosecution of the Khmer Rouge leaders who are responsible for the crimes against humanity. This is again a double standard on the part of Hun Sen. International judges at the tribunal appointed by the UN have summoned the minister of Finance, Keat Chhon, the minister of Foreign Affairs, Hor Namhong, the president of the Senate, Chea Sim, and the president of the National Assembly, Heng Samrin, to respond to questions at the court but Hun Sen has prevented them from appearing. This is obstructing justice. Why do they look at Kem Sokha’s comments, which have been distorted, and not look at the people who have obstructed justice for the Cambodian people? You were due to launch – in person – your new book We Didn’t Start the Fire: My Struggle for Democracy in Cambodia on Wednesday in Bangkok before you were barred from Thailand. It’s a look back at your life as the former Cambodian finance minister and as the leader of the opposition. Looking to the future, do you think your own personal story, and the story of Cambodia, will have a happy ending? Every day that passes is a victory. Under the present circumstances, staying alive is quite an achievement. Since I founded my party 15 years or so ago, at least eight colleagues and supporters have been assassinated. No convictions have ever been made, and no investigations have ever been started. There is total impunity in Cambodia. I have counted the colleagues and supporters who have been arrested, tortured, beaten – those that have had their lives taken away. Under those circumstances, just being alive is already an achievement. However, we are gaining more and more support every day, as evidenced by the results of the elections, despite rigging. We have managed to increase our share of the vote from one election to another. This is quite an achievement, as is keeping hope alive. I think history is on our side: Democracy is making progress everywhere, including in Burma recently, so I’m really confident that while it’s an uphill battle, we will reach the top of the hill in the not-too-distant future.